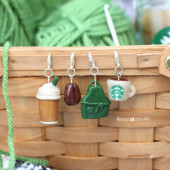 My crochet leaf pattern makes it’s appearance again with 9 green leaves on a branchy tree for the 9th page of my Earth Day Crochet Quiet Book! I would love to see one of you make the leaves in different colors as well so it looks like it’s the autumn season. 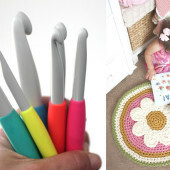 So many ways to tweak all of the crochet pages I have posted! I am making an Earth Day Crochet Counting Quiet Book! It will have a total of 10 pages and I will be posting each page separately in a series of 10 blog posts and then one final post to showcase the whole book and how to put it together. They will all be posted in time for Earth Day on April 22nd! 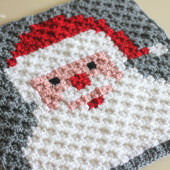 You can also use these “pages” as granny squares and create a blanket instead! Finished size of the pages/squares are approx 9×9. First you will want to crochet the book page. 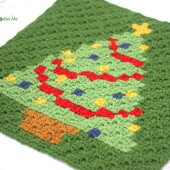 Note: when you begin to make the tree branches (row 19), you will see that you get into a rhythm of making chains and slip stitch down those chains and then making other chains that jaunt out from the original chain and slip stitching down those, etc. It can be totally random!! You don’t have to follow my exact pattern! Row 19: SC in first 3, 2 SC in last, chain 20, Slip stitch in second chain from hook and in next 5, chain 5, Slip stitch in second chain from hook and in next 3, join with a slip stitch to the original chain, slip stitch in next, chain 15, slip stitch in second chain from hook and in next 6, chain 7, Slip stitch in second chain from hook and in next 5, join with a slip stitch to the next spot on chain 15, slip stitch down the rest of that that chain and join with a slip stitch to the original chain, slip stitch in next 6 on original chain, chain 10, Slip stitch in the second chain from hook and the rest of the way down, slip stitch back to original chain and in any remaining chains on the original chain. Fasten off. Row 27: SC Decrease, fasten off leaving long tail. Stitch tree onto crochet page. Stitch leaves to branches… maybe a few leaves have fallen to the ground as well! Chain 17 and shape into a 9. Stitch on with tapestry needle. Have you made the first 8 pages? Please be sure to tag me on social media if you are making this with me by using the hashtag #RepeatCrafterMe or @RepeatCrafterMe ! The writing, illustration, and design of this book is copyrighted. Do not attempt to publish the writing or pattern of my book as your own. You may crochet this book using my pattern. Thank you so much for this wonderful project. I look forward to stitching the entire book when the postings are completed and I can buy the yarn I’ll need. Our parish is always looking for unique items for their craft booth at their fall bazaar and I’ll have plenty of time to work on this and some other projects as well. Thank you for sharing your talents with us. You are a gem. Sarah, I wanted to congratulate you on your uniquely creative approach to crochet projects. I have been following you for many years and love your darling designs that are easy to make. Your monster bib and animal hats always get “oohs” and “aahs” when I give them to young mothers. This quiet book will be one more thing I will tackle as a gift. Kudos to you!